Each cottage welcomes up to 6 people and has 3 bedrooms of 40 sq. feet. "Le Grand Duc" has one bedroom on the ground floor, facilitating access to seniors. "Le Cygne" has three bedrooms and one toilet on the first floor. Each room enjoys a view either on the interior courtyard of the property, or the private garden filled with Mediterranean scents with fountain, or the forest and the valley. 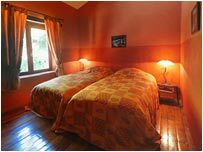 In each cottage, 2 rooms are equipped with 2 single beds king size (90cm x 200cm) et one room with double king size beds (160cm x 200cm). You will find storage in each room, a chair, and for the main bedroom a small desk. 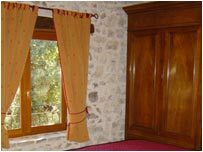 Towels and household linen are available in each cottage, and beds are set for your arrival.